Welcome to DeNami's April Blog Hop! We have a super creative line up this month, as we do every month and I can't wait to see everyone's creations! The theme is Monochromatic! I have in the past been a self proclaimed monochromatic girl! I love things simple and with different shades of the same color! If you are following the hop, you got here from my sweet friend, Michele's blog! You can't tell from the picture but the umbrella is stamped on Lemon Tart and the background is Harvest Gold. The layering of the monochormatic colors looks so pretty IRL! I stamped the background with DeNami's Polka Dot background stamp! And I am SO in love with that sentiment! Your next stop on the hop is the adorable Wendy! You can go back to the DeNami blog too, for a full list of participants! When: The blog hop starts on April 10 at 6 AM,PST. However, you have until April 11, 2011, 11:59pm PST, to leave comments on all the blogs (to be eligible for a prize). Why: To be inspired by beautiful creations featuring DeNami Design stamps and also the chance to win mini shopping sprees on the DeNami Design website! Extra Challenge: This blog hop filled SO quickly, so we thought we'd bring an additional opportunity for those who weren't able to get on the list, and also those blog hoppers who had additional monochromatic projects to share. We will have a link widget on the blog hop post where you can upload additional monochromatic creation(s). We'll choose one winner to be guaranteed a spot in the next blog hop AND they'll get to choose a few stamps of their choice! So glad you stopped by today! Have a great Sunday! This is such a cute cute card! Great card, I like the sentiment too! Laurie, this is so ADORABLE! Love the lemon tart and harvest gold together! Especially love the sparkly umbrella!!! What a great monochromatic card!!! The yellow and gold are great together--they are two of my faves, also. Never thought of using them together, but they ended up looking great. Very nice card. Such a CUTE card, Laurie! I love that you paired up the Lg. 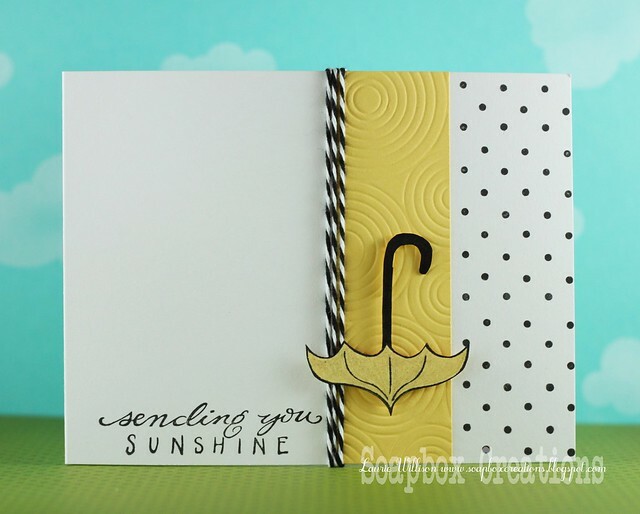 Open Umbrella with the Sending You Sunshine sentiment- they work together so well! Also, I love that twine addition; it looks fab on this card! The yellow in your card is so fun and vibrant! I love the bold look of it all. I love this card! I have to get the Polka Dot background stamp! Thanks for sharing! This card is so incredibly fabby! Love, love, lo-ve (in a singsongey voice) it! One of my favorite kinds of cards to make is black and white with a hint of color. Good job! I love your card. I love that the umbrella is upside down. What a fun, easy change up for this stamp! Definitely one of my favs! This card is just darling. Laurie, LOVE the umbrella against that embossed panel! LOVE the polka dots and the matching twine! And that sentiment is a FAV of mine, too! So perfect with the upside down umbrella! FAB card! nice design that would cheer up anyone who was the recipient of the card! Cute, cute, cute! Love the details! The twine adds such a POP! This is so CUTE! I love it! Great job. I love that umbrella! So cute! There's something special for you on my blog today! Love your card. I love how it is so clean and crisp. Not too busy. Great job. Laurie...this is a beautiful card! I love yellow (and almost chose it myself) as it is so bright and cheery! Such a cute card. I like that sentiment too, adding it to my wish list! What a springy, happy card. Love the yellows, and I agree, what a cute sentiment! Nice job! I love the yellow and black combinations. The baker's twine and textured papers are fabulous. Love the umbrella and embossed yellow paper together! Soo cute. The sentiment is perfect for your card. A cute, happy card!! TFS!! That is a great sentiment and a very cute card! So cute, Laurie, love the twine accent and the fabulous texture! Love the embossed circles...a beautiful card. Laurie I think this is the sweetest darn card ever! I have the PTI umbrella stamp set and even though I LOVE it, I get stuck on how to use it. I have saved your little creation to CASE one time. I hope you don't mind! I love your cards. You make them look like it's quick and simple. Beautiful. Love the sentiment and the font... The use of black ink really makes the card pop. Oh my such a fun card Laurie! Love the polka dots and the swirls! Of course that cutie little umbrella placed upside down is fun! Cute, cute, cute, and I love the sentiment! I love the yellow/black color combination. I don't think I've ever made a card that focused on yellow - I might have to give a whirl very soon! Thanks, Laurie - for your cute creation! How cute is this?! The colour combo is sublime ... great job and love the impression plate you chose too ... how perfectly fitting! WOW Laurie I love the yellows! Of course umbrellas are pretty awesome too! Great card! What a sweet card - I am so glad you picked yellow, it is such a happy colors and a lot of people seem to shy away from it. Great card. Love the sentiment and umbrella with the yellow cardstock. Super fun! What a cute idea, I love the yellow and black combo too! Totally ADORABLE!!! LOVE the upside down umbrella, your color choices and the polka dots!!!! Fabulous work, girlie!!!! Love this! Great job with the colors and the simple LO! Very cute simple card!!! Love it! I'm usually not a fan of yellow, but I LOVE how those yellows look with the white and black. Very pretty! Such a fun card Laurie! The impression plate makes the best sun! Love that sentiment myself and used it for the last Denami hop! Really cute card. I love the colors and so creative! Thanks for sharing! Simple & stunning! Love the upside-down umbrella! Such a clean, crisp card. Love it. What a clean, crisp, sweet little card! That umbrella is adorable upside down!!! This is such a cute card! Love the umbrella and the subtle lemon colours! Love the lemon color! Your card is so springy! This is really cute! Love the contrast of the yellow/black and the upside down umbrella! simple but very cute card !